The X-Act Contour™ liner is the latest development of the famous . The pattern has been improved, with more and deeper channels, to provide even better draining. Extra care has been taken in developing the surface material, to provide a nice and soft feel, combined with a finish that looks like a factory OEM finish. This makes the X-Act Contour™ liners look like an integral part of the standard equipment rather than as a protective aftermarket addition. 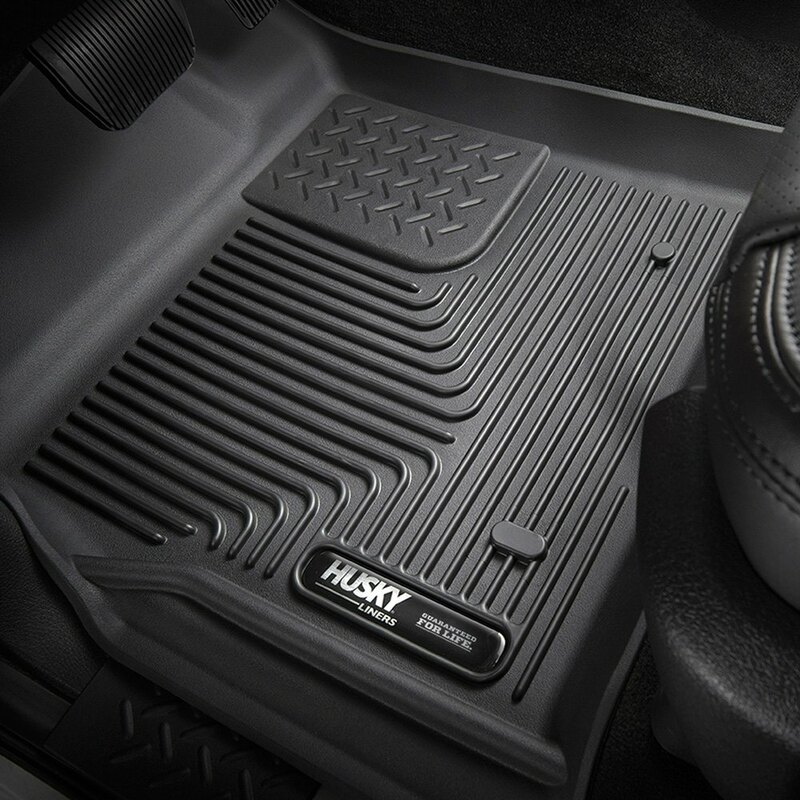 Whether you take your vehicle to the ski slope or the beach, drive it in pouring rain or in the dust bowl, the Husky Floor Liners will keep the floor dry and clean. They are made to provide real protection in all kinds of weather and all kinds of conditions. The liners are designed to work perfectly in extreme cold as well as in extreme heat, to protect your floor from melting snow, salt, mud, sand and all kinds of spills. The deep channel pattern is developed from Husky’s long time experience with . It has features ensuring that your feet are kept clean and dry. The ridges scrape off snow and dirt. Channels between the ridges trap liquids, sand and mud and keep the moisture and debris away from your feet. A high lip around the perimeter contains the dirt and moisture until it is time for cleaning. The surface not only looks and feels good, it is also designed to repel dirt, and the pattern has an open design that is easy to clean. The perfect fit is not only essential for containment of liquids and dirt, it is also an important safety factor, as it prevents the liners from sliding out of place. To enhance safety, the liners also have a slip-resistant backing material featuring Husky’s patented SPiN technology with integrated Sta-Put nibs that dig into the original floor covering to prevent the liners from shifting. The liners are also compatible with OEM floor mat anchoring systems for maximum safety. All Husky liners are made of Polydurathene™, a patented proprietary thermoplastic material that is developed specifically to meet the strict demands of Husky Liners. The material is guaranteed to never crack or warp. It stays flexible even in the most extreme cold. It remains odor-free and non-sticky in the most extreme heat. It is durable and has a good tactile feel. There is no better material to be found for production of perfect automotive floor protection. And there are no better liners in the market than the Husky Liners.